It is a rare Saturday off for Michael Moroney and his team this weekend but we have two nice horses heading to the Bendigo meeting on Sunday... Murcielaga (pictured) and Lord Barrington. Tackling a 1300m Showcase event at his first run since mid-March, Murcielaga was a bit below his best last time in but the five-year-old does boast a handy fresh record. "He is back at the right time of year for him," Moroney reported, noting that "he has been going well." "He has had three jump-outs in preparation for his first up run so he is forward enough to run a nice race." We are hoping for a running double with Lord Barrington contesting the following race, the fifth heat of the competitive Silver Bowl series. Right in the thick of things at both of his runs this time in, the Darci Brahma three-year-old is nicely primed to show his best up to 1400m. 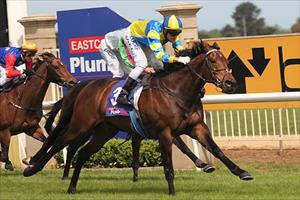 "Both of his runs have been very good as has his work," said Moroney. "It is a tricky draw but we are confident that he will prove competitive."